Just a quick update on Rodin today. He’s been a bit slow starting, worked on him everyday this past week but played with colors, set a few bits then would pull them out and change my mind. His eyes are done at this point and part of a cheek, earlier on he was experiencing what any woman who’s ever used cheap mascara has experienced, raccoon eyes. 😉 They’re still there a tiny bit but it will all blend in once the areas around the eyes are better filled. At least I’m hoping they will! 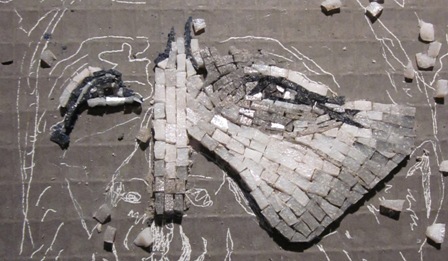 No matter how hard I try, I just keep going tiny with the pieces, really really need to break out of this habit then the mosaics would complete a lot faster. But with bigger pieces it always feels for me like less effect in shading and shaping occur so inevitably I end up going small. Arrgghh! Rodin will take some time, I may start a second project just to avoid burn out from only working on one thing. We went to Montreal this past weekend to see some of the Just For Laughs festival. Unrelated mosaic note here – if you love stand up comedy, or even like it just a little – this is a fantastically fun festival. Highly recommend it and Montreal is a fun city for a long weekend too. Anyways – while in Montreal we went and got me a great big piece of Wediboard. If you keep up with our blog you may remember my excitement at discovering a Canadian distributor who not only wasn’t too far away but less expensive than the US, an unheard of event usually in Canadian life! So now I’m home with a 3’ x 5’ piece of Wedi and dreaming of what will come out of it. Here’s a little lowdown for you on what Wediboard is and why it is great for mosaic. Wediboard is most often used as an underlayer in bathrooms and kitchens by contractors. 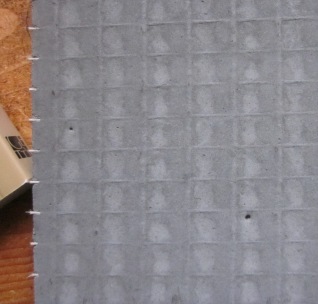 It is made by a German company and has a blue foam core that is then covered in a thin layer of cement and mesh. This makes it super light weight, waterproof, weatherproof (excellent for outdoor mosaics), rigid, doesn’t need to be sealed. You can also cut it with a utility knife and don’t need any special equipment to make fun shapes or even plain old squares. Why is this good for mosaics? Well, mosaics are heavy. Having a lightweight base, especially on a larger project is a bonus. Mosaics are also heavy (did I mention that?) so they can easily warp a surface rendering all your hours and hours of hard work useless as it breaks or cracks your mosaic. In order to be safe with your mosaic when you use a wood (or MDF) base, it has to be quite thick, often ½” thick or more is recommended. A ½”+ thick piece of plywood or MDF is heavy in and of itself, lay on a mosaic and dang it can get heavy quick! Don’t get me wrong, I use wood sometimes for sure but a lighter more easily cut surface at a good price is better. Wedi, since it is weatherproof can also be used outdoors. Sometimes we want to mosaic a nice decorative panel for the outdoor patio wall but don’t want to mosaic directly on the wall, Wedi is there and much lighter weight than marine plywood. “Can’t you use cement panel?” some of you may ask, after all it too is weatherproof, waterproof, probably won’t warp and is thin. You’re right! Cement panel you see at the hardware store is also used as an underlayment in kitchens and baths – and yes you can use it in mosaics for sure. It is a great surface. 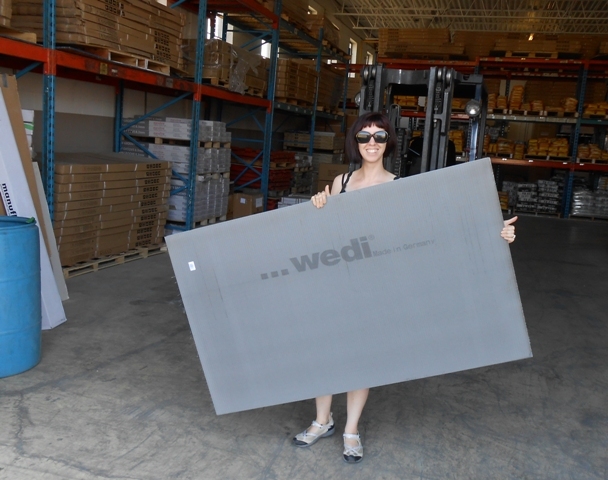 But the Wedi is still lighter, easier to cut and has all the same great properties. Well, maybe some of you out there don’t love Rodin, but thanks to my High School French Teacher who introduced me to him, I gained a healthy love for his work. Earlier this year I was in Paris, and finally on this visit I was able to go to the Rodin museum and gardens. It was spectacular, just loved it, loved seeing the huge Thinker and the Gates of Hell in their giant glory in the garden. The timing of this visit was great too as a special exhibit of some of his drawings were on display that aren’t usually out. 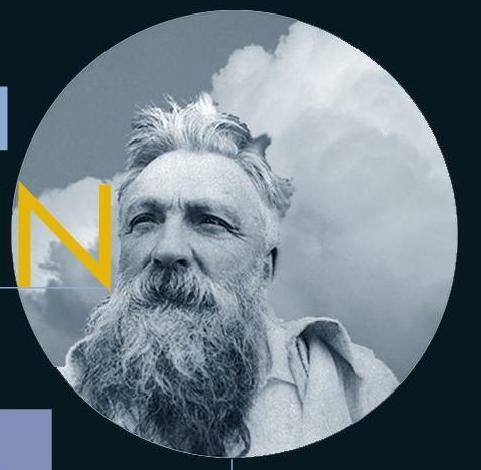 Anyways – years ago, I saw this pic below of Rodin on the French museums’ website. 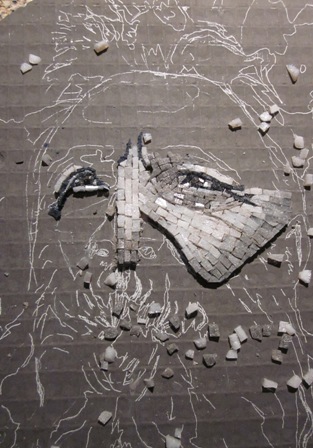 It really grabbed me, and I took it to a mosaic portraiture class in 2009 thinking maybe I could mosaic it. The class ended up using different materials for the portraits, but I kept my Rodin photo for future use. Finally the time has come and hopefully he’ll turn out well. Keep checking back in with us to see him come to life!